French wicker table with magazine holder and hairpin iron legs. Measures: 24" W x 16 1/2" D x 17 1/4" H.
Angular French wicker magazine holder or fruit basket. 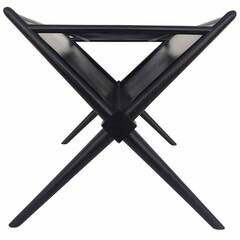 Jens Risom style wedge top magazine table. Combines modern form with function. Great for living room, bathroom or waiting area. Please confirm item location (NY or NJ) with dealer. A black lacquered walnut magazine table by T.H. Robsjohn-Gibbings from the 1950. 1950s design side table composed of a wrought iron structure forming a magazine rack and a wooden shelf. Side table with integrated magazine rack in copper, metal and teak design 1950s and amazing work: black metal structure, a teak shelf, double face copper side. 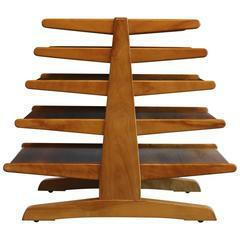 Edward Wormley magazine tree table or rack model # 4765 for Dunbar. 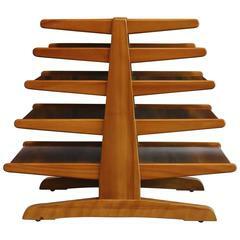 Edward Wormley magazine tree table or rack model #4765 for Dunbar. 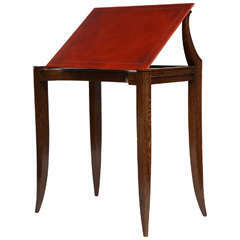 Refined drawing table in the manner of Christian Krass with adjustable/ removable leather top. 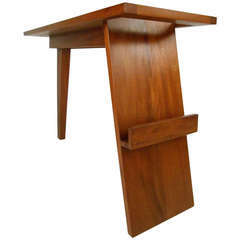 French walnut Dupond adjustable bookstand from 1920s This bookstand could be used like a side table when in lower position.